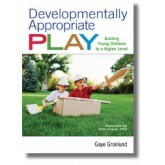 Developmentally Appropriate Play will help you understand how to plan for, guide, and identify purposeful play and in addition gives important information on creating a conducive environment, interaction and provocation, helping children to make choices, and documenting and recording to further enrich play. 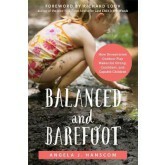 Outdoor play spaces are an important part of the environment for all young children. Specific benefits of outdoor play for children with additional needs include motor skills development, physical fitness and aerobic exercise, and social and emotional development. There are loads of opportunities to play and discover outdoors, and very few reasons to ever exclude a child with an additional need. 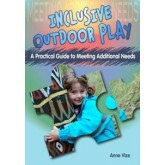 This warm and engaging book shows how – with just a little creativity and some lateral thinking – outdoor play spaces can meet the needs of many young children. We all know the value of play and how vital it is for young children’s development. 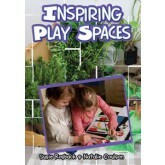 This book is designed to encourage and inspire early childhood educators in all settings to create open-ended play spaces that will provide opportunities for children to investigate, explore, discover, practise, try, fail, succeed, observe, imagine, dream, pretend, share, listen and participate in everyday activities, thus allowing them to develop a sense of who they are and an understanding of the world in which they live. 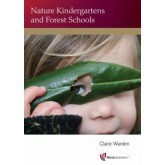 The book shows a variety of ways in which different spaces can be executed and set up, and describes in detail how these experiences support educators to meet the requirements of the EYLF and the NQS, respond to children’s interests, and understand the benefits of play. 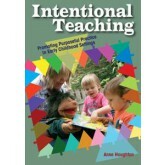 This book helps educators in all settings to understand the principles of intentional teaching, and highlights how intentional teaching practices can support learning outcomes for children. 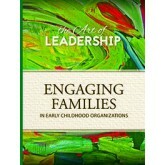 The book includes shared understandings of intentional teaching through conversation and reflection with many educators. Its purpose is to portray real and meaningful stories to highlight the ways in which educators have been intentional when planning for education and care with children. 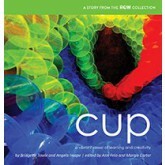 In the clips on this CD you will observe playfulness in action, sometimes with an adult serving the role of reflective guide, wondering out loud with the children, seeking to identify the pattern in what has happened without stopping the flow of the play. You will also see children negotiating the rules of a game, the chosen symbol for pretend tasks, the timing of collaboration, the challenge of acquiring skills, the variation of functions, and permission to enter the group. All of these negotiations offer children the opportunity to think, to plan, and to modify their strategies in the mindset of play. 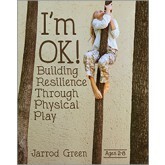 An in depth look at the learning that occurs during a child's everyday play experiences. From his third birthday to his fourth we follow his development and watch him at play as his interactions change as he gets older. 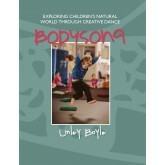 Filmed over a year, this production follows a 3-year-old boy at play in a wide variety of settings. He is seen on his own, with his mum, in a group and with a friend enjoying indoor and outdoor play around his home and playgroup. 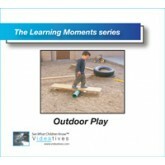 The sequences show how particular sorts of play enhance learning and development. They can be used to practice observation and assessment and to look at the implications for planning. 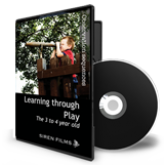 The DVD as a whole gives a clear view of the child’s learning and development as he gets older. It builds up a holistic picture, telling us about his interests, social development and general disposition. 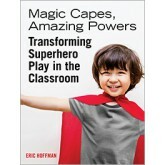 Magic Capes, Amazing Powers takes an in-depth look at why children are so strongly attracted to superhero and weapons play, examines the concerns of parents and teachers, and suggests practical solutions that take into account the needs of children and adults.